Our motto: Connect + Inspire. 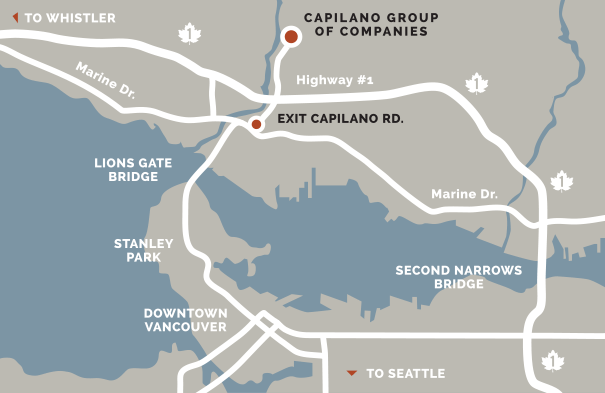 At the Capilano Group we connect with nature, with our guests, and with our team. Our hope is that you feel inspired by the spectacular surroundings and inspire others to connect with nature. We believe in providing opportunities to people with passion and enthusiasm. For most of our jobs, we are prepared to train those with little or no experience. 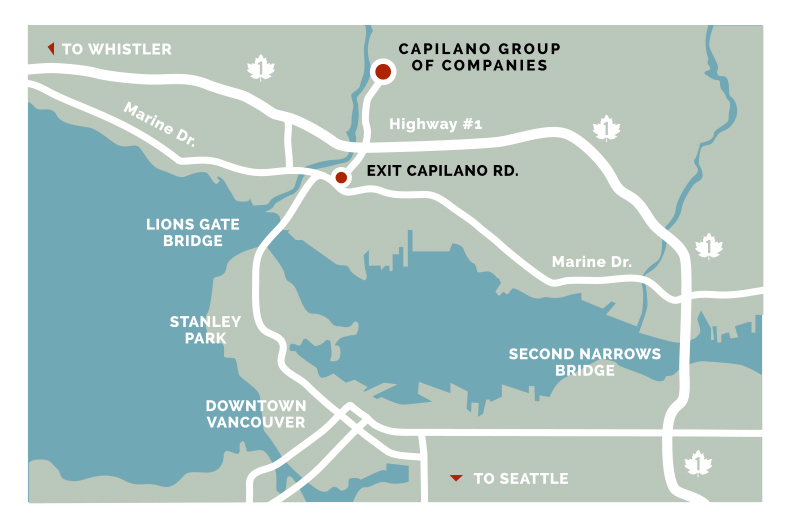 If you love nature and meeting people from around the world, a Capilano Group property may be the experience for you. Easily accessible by transit: from downtown Vancouver ride the Seabus to Lonsdale Quay and take the #236 bus to Capilano Suspension Bridge Park. Moraine Lake Lodge is a pleasantly scenic drive west from Calgary to Banff National Park. Air travelers arrive at Calgary International Airport. Head west on Airport Trail NE (1.2 km/0.75 miles). Turn left to merge onto Deerfoot Trail NE S/WY – 2 S (8.0km/5 miles). Take exit 258 for HWY – 1/16 Ave N W/16 Ave N E/Trans Canada Hwy (0,8 km/0.5 miles). 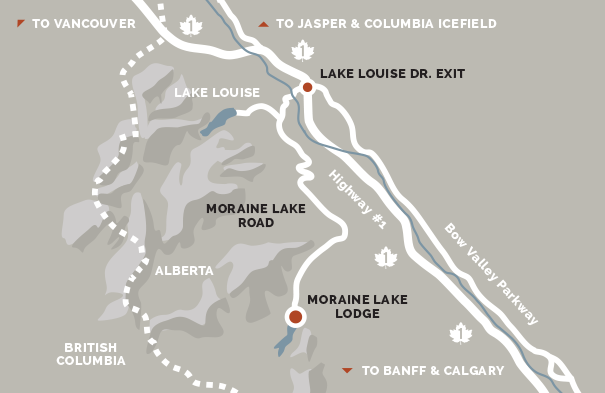 Turn right at 16 Ave NE/HWY – 1 W/Trans Canada Hwy W Continue to follow HWY – 1 W/Trans Canada Hwy W Continue to follow HWY – 1 W/Trans Canada Hwy W (181 km/113 miles) Take the Bow Valley Pkwy exit toward Lake Louise (0.5km/0.3 miles). Turn left at Bow Pkwy (0.2 km/0.12 miles). Continue on Lake Louise Dr (2.2 km/1.4 miles). Turn left at Moraine Lake Rd (12.2 km/7.6 miles). 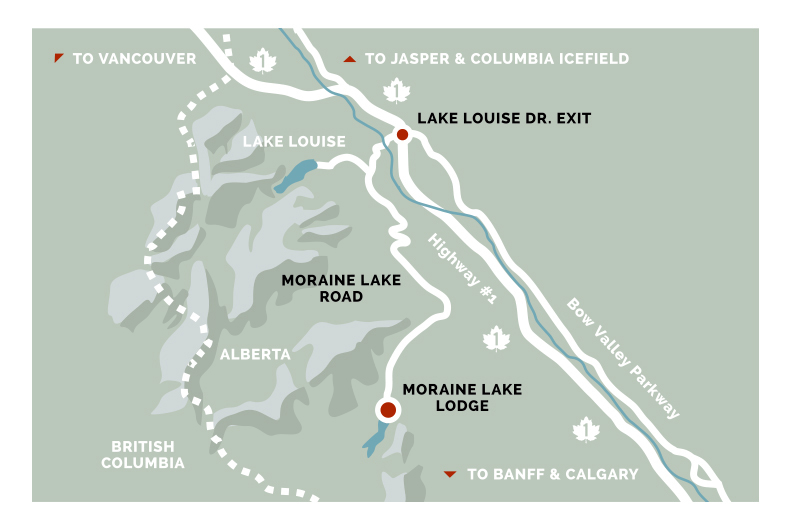 Cathedral Mountain Lodge is located just 15 minutes west of Lake Louise, three kilometers off the Trans Canada Highway on Yoho Valley Road. Cathedral Mountain Lodge is located approximately 200km (125 miles) from Calgary, Alberta. To reach the Lodge from Calgary, leave via 16th Avenue heading west. This route turns into the Trans Canada Highway #1. This highway will go past the town of Canmore, which is approximately 10 minutes from Kananaskis, then past Banff and Lake Louise before crossing into British Columbia. 5 km into British Columbia the highway starts a steep descent; at the bottom look for a right hand turn off labeled Yoho Valley Road or Takkakaw Falls. Traveling 4 km along this road will take you directly to the lodge, on the right hand side after the first bridge. From Vancouver Airport you will want to go south on Highway 99 towards Tsawwassen (Ferry Dock). Exit onto Highway 10, which will be labeled as the direction to reach Hope. After the town of Langley, Highway 10 will join with the Trans-Canada Highway #1, which will take you east to Hope. 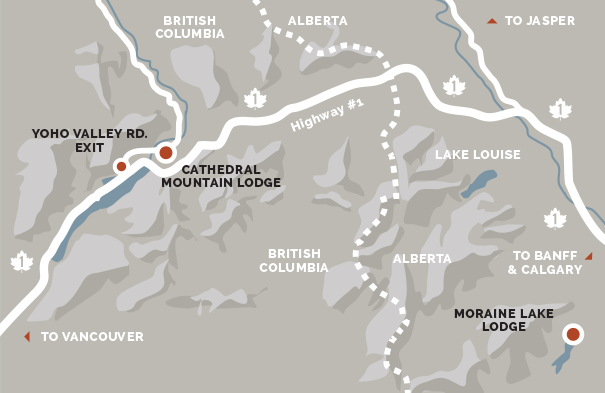 At Hope it is best to leave the Trans-Canada Highway #1 and take the Coquihalla Highway as it is shorter. The Coquihalla Highway will take you to Kamloops where you rejoin the Trans-Canada Highway #1 heading west. Follow this highway all the way past Golden and into the Yoho National Park. 60 kilometers the town of Golden and 2 kilometers past the town of Field there is a turn off to the left clearly marked Yoho Valley Road or Takakkaw Falls. Traveling 4 km along this road will take you directly to the lodge, on the right hand side after the first bridge. 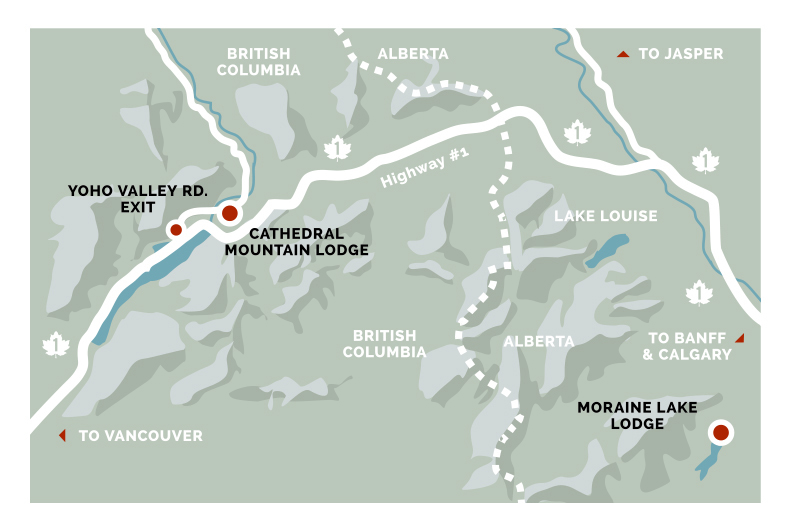 Please keep in mind that Cathedral Mountain Lodge is 840 kilometers from Vancouver, much of which is through mountain terrain that may necessitate slower driving. Drive on Georgia Street northbound, towards Stanley Park in the right hand lane. As you enter Stanley Park, you will come to a round-about. Drive straight through the roundabout, past the Rose Garden sign and take the first right onto Pipeline Road. 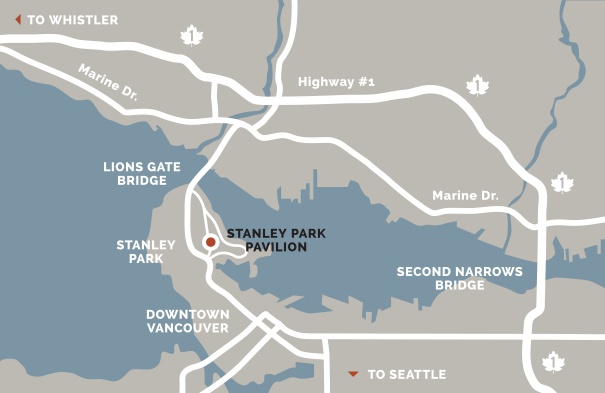 Stanley Park Pavilion is located on your right hand side. 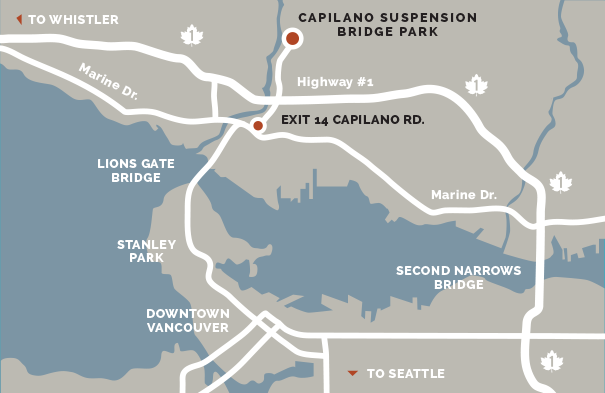 Drive southbound over the Lions Gate Bridge, pass through Stanley Park and turn around at Denman Street. Head back towards Stanley Park and follow the above directions. Most Direct Route: Drive northbound along the Causeway heading towards Lions Gate Bridge. Take the right turn exit immediately before the bridge located at the “Lions” guarding the Lions Gate Bridge. Make a mandatory left hand turn at the stop sign onto Stanley Park Drive. Prospect Point is located approximately 0.5 kilometres (0.3 miles) on your right. The Scenic Route: Drive on Georgia Street northbound, towards Stanley Park in the right hand lane. As you enter Stanley Park, you will come to a round-about. Drive straight across the roundabout, and follow the road to the stop sign. Make a mandatory left hand turn onto Stanley Park Drive. 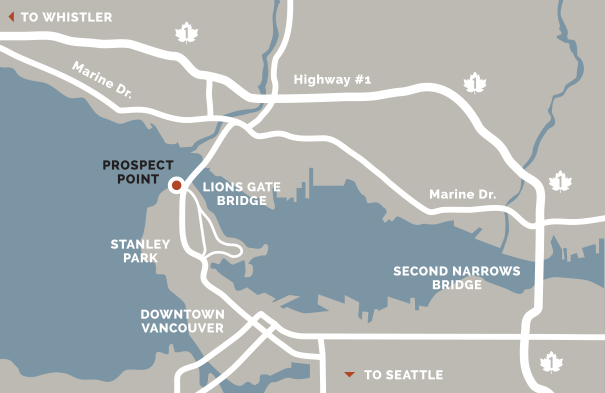 Prospect Point is located approximately 1.5 kilometres (0.9 miles) on your right. Head south over the Lions Gate Bridge. Immediately after crossing the bridge take the 1st exit, Stanley Park Drive. Make a mandatory left turn at the stop sign. Prospect Point is located approximately on 60 metres (200 feet) on the right.